Last night, thousands of people tuned in to the 84th Annual Academy Awards. The glitz, the glamour, and scores of actors, actresses, and celebrities occupied the red carpet. Even though that there was a lot of buzz about who should win for each category (congratulations to Octavia Spencer for winning Best Supporting Actress! ), the natural hair world focused on Viola Davis. The Oscar-nominated actress for her role of Aibileen Clark in the movie The Help was breathtaking in her emerald green Vera Wang gown and, yes, her fabulously chic natural pixie cut. She looked beautifully radiant as she made her way down the red carpet with her husband, Julian Tennon. Numerous media networks gushed over her new look, and my Facebook news feed was loaded with images and comments about how wonderful it was to see Viola discard her wigs and rock her medium auburn natural fiercely. Although she didn’t take home the Best Actress win, she was already a winner with her natural beauty. 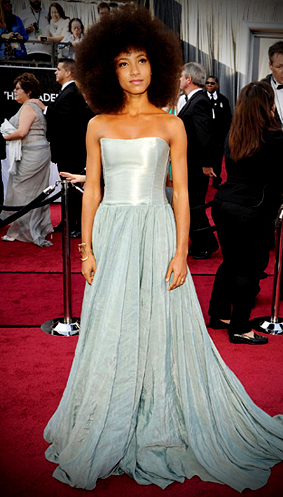 The Oscars weren’t the first time she debuted her natural tresses. The SAG award winner worked the lens like a supermodel for a high-fashion LA Times Magazine spread earlier this month. She donned glorious black pieces and ensembles from Marchesa, Jason Wu, and Thierry Mugler. However, it was the close-up that sent everyone into O-M-G mode solidified her spot as a natural hair inspiration. Her natural pixie cut complimented her gorgeous bone structure perfectly. Talk about giving great face! We also noticed her incredibly toned, healthy body, something that I’ve never noticed before when she wore the wigs. Man, he was absolutely right! She is boldly professing her statement loud and clear. Viola isn’t the only celebrity who sports her natural. Esperanza Spalding wore her lush afro big and proud for the Oscars and had done a remarkable job singing during the tribute to the stars we’ve lost in the last year. Actresses such as Lisa Gay Hamilton, Sophie Okonedo, Monique Coleman, Kim Coles, Raven-Symone, and Yaya DeCosta have been rocking their natural tresses. Singers India.Arie, Jill Scott, Janelle Monae, Res, Michelle N’degeocello, Rissi Palmer, The Floacist, Laura, Izibor, and Leela James are a few of the many hair inspirations for Black women who are transitioning, have done the big chop, and/or growing out their naturals. Tomiko Frasier-Hinds, an actress and model who appeared in Maybelline ads, shined in the Gain commercials with her super adorable fro and dazzling smile. Suzan-Lori Parks, Ledisi, Whoopi Goldberg, Alison Hinds, and Toni Morrison are some of the many sistas who wear their locs proudly. The natural hair movement is definitely making its way into Hollywood. I don’t see it as a trend that will stay for a hot moment and then disappear. Honestly, it’s not a trend; it’s a lifestyle. I firmly believe that the more Black women are learning how damaging and caustic relaxers are, the more we’ll accept and embrace our natural beauty. If Viola Davis can shun the wig, and proclaim her natural beauty for everyone to see, this should give sistas the encouragement to follow suit. We should not be afraid to step into who we are!